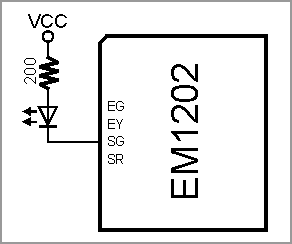 The EM1202 has four LED control lines -- SG, SR, EG, and EY. All lines have the same internal structure and the LEDs should be connected to these lines as shown on the schematic diagram below. Maximum load for each line is 10mA.